are partnering up with the Buhl Foundation to present the Northside Keeps It Clean campaign to fight litter and increase recycling in Pittsburgh’s Northside neighborhoods! Litter poses huge threats to our environment and wildlife, killing and injuring wildlife, pets, plant life, and more. Additionally, litter poses safety risks to the people and visitors of Pennsylvania – roadside litter causes traffic accidents, and litter in our neighborhoods can cut or injure children. Accumulation of litter can also pose fire hazards, and can serve as breeding grounds for potentially dangerous bacteria and vermin. Furthermore, PennDOT spends millions of taxpayer dollars every year to clean up litter along our roadways. In our communities, litter lowers property values – it is unsightly and is widely accepted as a contributing factor in the overall disintegration of neighborhoods and communities and as leading to more serious problems including vandalism, graffiti, illegal dumping and more. And of course, litter is illegal. Litterbugs can be charged as much as $300 for littering from a vehicle in Pennsylvania, and most local governments will also fine pedestrians for littering. In a recent survey of Northside residents, 51 percent of locals reported litter as a pressing issue. In response to this growing problem and concern, PRC and ACW are implementing a multi-faceted campaign to fight litter in these neighborhoods. From Troy Hill to Chateau, we will be working in communities, with residents young and old to fight litter. This strategy involves working with every 5th grade student in Northside schools to teach them about the negative impacts of litter and how they can fight it. Additionally, Allegheny CleanWays will be leading several litter and illegal dumpsite cleanups to fight existing problem areas and to reduce future littering. To further reduce litter and to increase the amount of materials being recycled, PRC will be distributing 1,000 recycling bins to residents of the Northside and placing more public space recycling bins in community spaces. Please find more information about these initiatives below, including how to register for your own recycling bin! 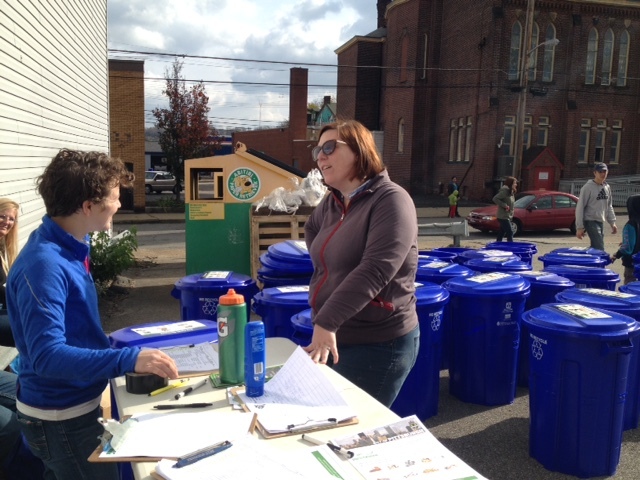 PRC and Allegheny CleanWays are working to distribute 1,000 recycling bins to residents of Pittsburgh’s Northside communities. Increasing recycling rates helps to fight litter, save energy, prevent deforestation, and prevent valuable resources from entering our regions’ landfills! Currently City of Pittsburgh residents are instructed to place their recyclables in blue plastic bags in designated recycling collection sites on their biweekly recycling pickup day. However, excess plastic bags cause issues to recycling plants (Materials Recovery Facilities or MRFs), clogging the machinery, reducing efficiency, and placing employees at risk. Using bins reduces the need for these bags and have the ability to increase recycling rates. By placing your recyclable materials, unbagged, in your new blue recycling bin, you’ll help keep valuable materials out of our landfills! Please continue to place your materials out in your regular pickup location on your regular recycling day. Sign Up for a Recycling Bin! PRC and Allegheny CleanWays worked hard in Spring 2017 to distribute hundreds of recycling bins to Northside residents. All the of the bins have been distributed – reach out to mkranii@prc.org with questions and comments about future recycling bin projects. Allegheny CleanWays is looking for volunteers to join our DumpBuster Crew in the Northside! DumpBusters tackle land-based illegal dump sites. A DumpBuster crew goes out nearly every day (weather permitting). Volunteers let the Northside DumpBuster Crew Leader, Al Chernov, know what dates they are available and he assembles a crew. DumpBusters typically work in the mornings from 9:00AM to around 12:00PM, but that changes based on volunteer availability, weather, or that day’s project. Check out Allegheny CleanWays’ website for more information. You can email janee@alleghenycleanways.org or call the office at 412-381-1301 if you are interested! Litter harms the local environment and our local communities, killing and injuring wildlife, pets, children, drivers, while posing as fire hazards and breeding grounds for bacteria and vermin. 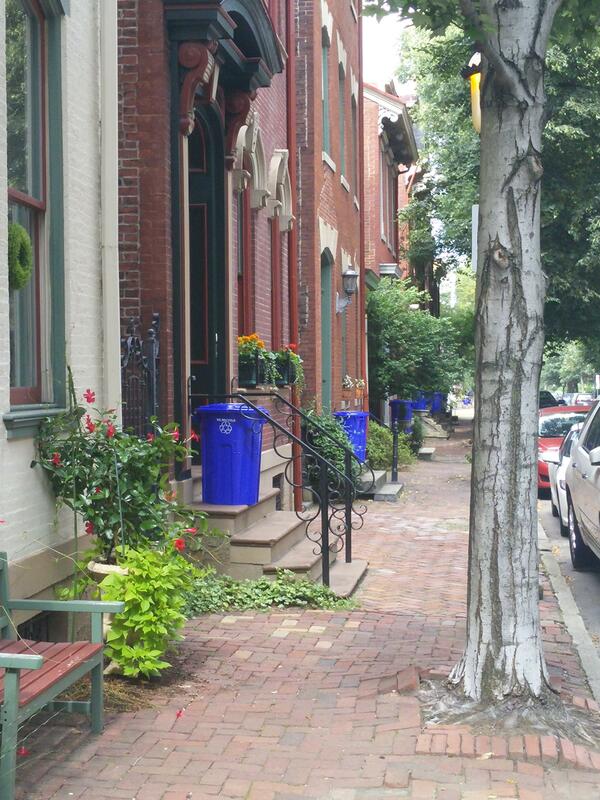 Furthermore, litter reduce local property values, impacting entire communities. Allegheny CleanWays is happy to provide gloves, bags, and other materials for your neighborhood cleanup! Email sam@alleghenycleanways.org to register your cleanup and to receive your cleanup materials! PRC’s education staff is presenting the Recycling and Litter Awareness Program to fifth grade students enrolled in Pittsburgh’s North Side schools as part of the Northside Keeps It Clean campaign, a project of the PA Resources Council and Allegheny Cleanways. Generously funded by the Buhl Foundation the project seeks to increase recycling participation. To this end PRC is educating students as to the why, what, how, and when of recycling in the City of Pittsburgh. The program seeks to raise awareness, inspire, motivate, and engage students who will in turn carry this message to their families in the community. Through a combination of lecture, slides, demonstrations, and games students learn how important it is that we all participate in reducing both consumption and materials sent to landfills. PRC is also excited to work with Northside schools to implement recycling programs! Many schools are unable to recycle due to issues with funding and staff resources. PRC and the City of Pittsburgh are currently working to implement recycling programs in targeted schools throughout the Northside neighborhoods.